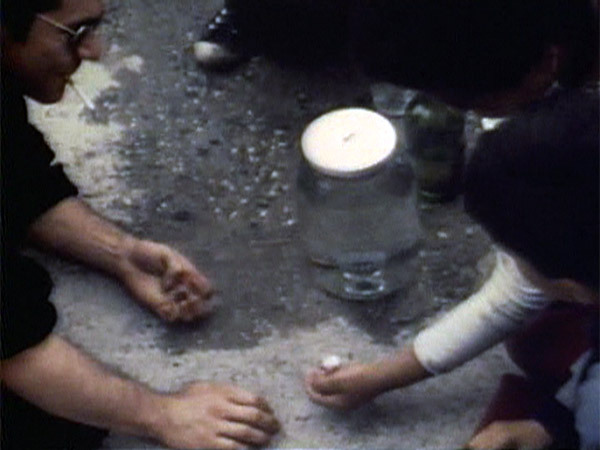 Tonight three films from the 1970s Lower East Side will be shown outdoors at La Plaza Cultural garden and community space at Avenue C and 9th Street. The screening explores the theme of home in the once-dilapidated neighborhood and is the third evening of the MoRUS Film Fest, organized by the Museum of Reclaimed Urban Space. The program begins at dusk with Coleen Fitzgibbon’s LES (1976), followed by Beni Matias and Marci Reaven’s El Corazon de Loisaida (1979) and Marlis Momber’s Viva Loisaida (1978). Fitzgibbon’s LES features striking footage of the Lower East Side’s buildings and people in 1976, just after the fiscal crisis had began to transform the city and led to the infamous New York Daily News headline “FORD TO CITY: DROP DEAD.” As a mock documentary, LES investigates the Island of Manhattma’s fiscal problems, which have resulted from the nefarious activities of the John Dough Cult. El Corazon de Loisaida and Viva Loisaida were both shot a few years after LES, and both celebrate the struggle to save the Lower East Side during the years of socio-economic disinvestment in the neighborhood that followed the fiscal crisis. El Corazon focuses on efforts to form tenant associations in buildings that have been ravaged by neglectful slumlords. Viva Loisaida explores the strong identity of Loisaida through the eyes of the neighborhood’s prolific photographer, Marlis Momber. “Loisaida” – or “LO-EES-EYE-DA” – is a reinvention of “Lower East Side” that Puerto Rican poets Bimbo Rivas and Chino García coined in the late 1970s. Both poets are also featured in Momber’s film.